The influence of social media is an undisputed factor in any online marketing strategy. But have you considered the demographics of its application? How much does social media marketing affect your business? We have seen companies use social media to establish a presence but how much does it figure into their selling strategies. We know that people feel that the experience in shopping online remains incomplete. A reason for this might be because of the lack of social interaction in e-commerce websites. How many is that? 45% people believe that physical stores offer better social experience. 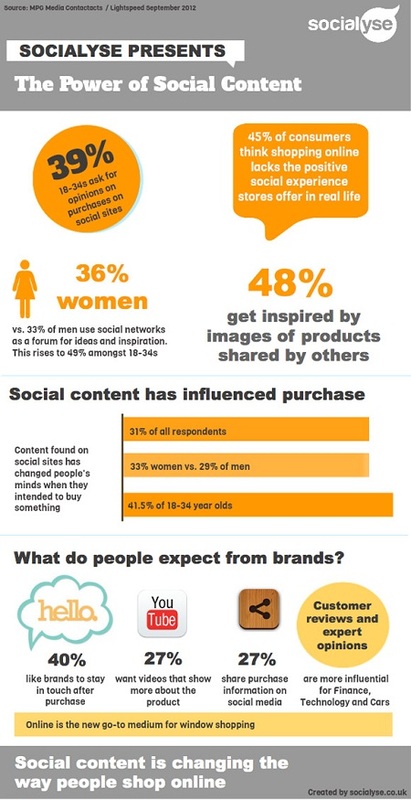 However when images of a product are shared on a social network, 48% felt encouraged to purchase the products. Age Group of 18-34 Year is highly influenced by Social Media. 39% of the people in the 18-34 yrs age group ask opinions on product purchase online. 36% women of the age group use social networking as a forum for buying ideas. The figure for men for the same is 33% in case you were inquisitive. That makes the figure to amount to 49% of the people of the age group of 18-34 year olds whose buying decisions are influenced by social media. Yes Social Media Influences Shopping Behavior? Read more here. So here are the results when people were asked whether at some point they had changed their mind about buying a product after seeing a content via social media marketing. 31% respondents admitted to it. So how do these people incorporate the social experience into purchase what is their expectation? 40% of people like brands to stay in touch after the sale. 27% want to see videos about the products. 27% share the purchase information. As we all know that customer reviews and expert opinions are more influential for finance, technology and automobiles. You can safely assume that the days of window shopping are numbered as more and more people share their purchase experience on their social networks. Now you won’t be just tackling buyers but you will be tackling popular opinion about your product. Find us on Twitter @letsnurture , Facebook Page, Google Plus Page, Pinterest Boards, Foursquare Page, Linkedin. Share your thoughts with us on our social medias.